I see them flailing from my kitchen window. I know if I don’t help, I’ll find them lifeless in the skimmer later. So I stop what I’m doing and head out to save more toads. One would think I’d be a Toad Hero, right? But no. They actually fight my attempts to save them, diving toward the pool bottom or skittering away across the water surface. They dodge the life-saving shallow net I dip in to carry them to safety. Each successful save is lifted out of the pool and gently turned out on the grass. Yet I receive no grateful croaks. Some of the toads, without even taking a few minutes to enjoy their new lease on life, head straight back toward the enticing water. They’ve already forgotten their panic-stricken flailing from moments before – they only have eyes for the sparkling surface ahead. 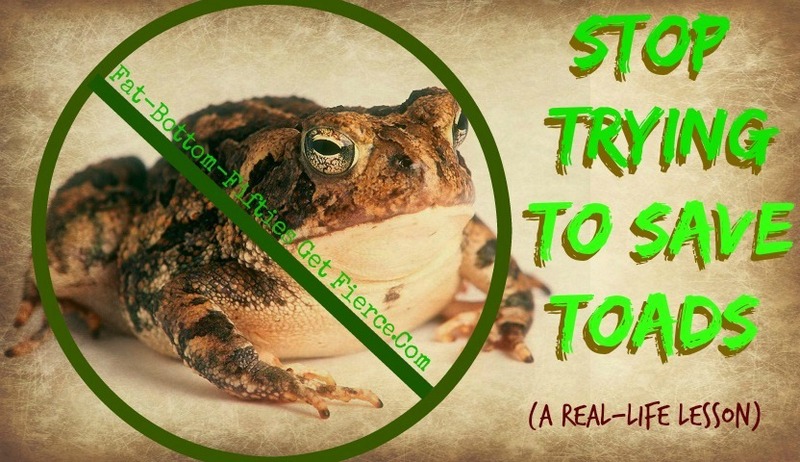 You just can’t save a toad that is determined to jump back in the pool. If you have a toad in your life, one that races back to the water no matter how many times you have scooped it out and laid it in the gentle arms of safety, you have two choices. You can either scoop until your arms finally give out, or you can acknowledge and accept the fact that toads have no heroes. Albert Einstien probably had toads in mind when he said the following: Insanity is doing the same thing over and over again and expecting different results.